When Dara Khosrowshahi took over the role of Uber CEO from company founder Travis Kalanick, no one thought it was going to be an easy transition. In just over a month, the new CEO has had to deal with numerous major crises left in the wake of Kalanick’s tenure. Now even more trouble is rocking the company and the board is set to vote on limiting Kalanick’s influence. The latest internal drama at the ride-sharing startup stems from a consequential decision last year by the company’s board to give Kalanick control of three seats. This decision pre-dated the sexual harassment allegations from a former engineer that sparked a leadership-shaking internal review. According to the New York Times, Khosrowshahi brought a proposal , co-authored by Goldman Sachs, to board members on Thursday that would, among other things, rein in Kalanick’s voting power. 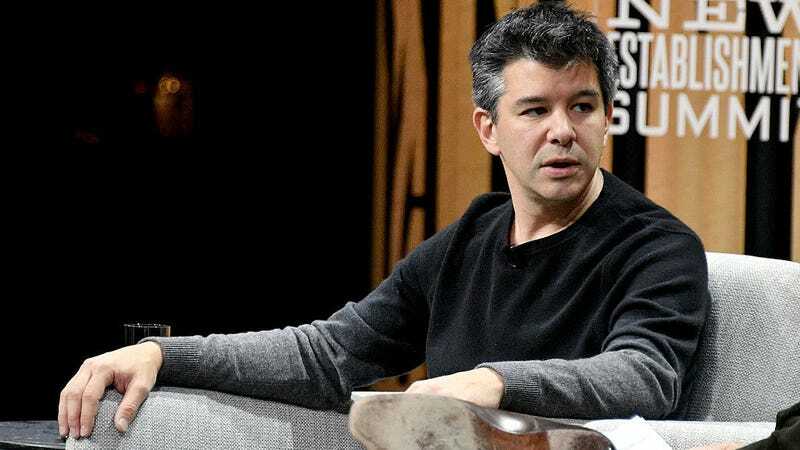 The move was simultaneously intended to give the CEO the control he needs to run the company and reassure the Japanese investor SoftBank which reportedly agreed to invest $10 billion on the condition that Kalanick is guaranteed not to return to his old position. I wanted to update you on some disappointing news from today. Travis appointed two new members to Uber’s Board without discussing it with me or the Board of Directors more broadly. Anyone would tell you that this is highly unusual. According to Bloomberg, the board will meet on Tuesday to vote on the proposal to shift to a structure in which shareholders get one vote for one share. Gizmodo has reached out to Uber for comment on nature of Tuesday’s board meeting and we’ll update this post when we receive a reply. The plan is an attempt to handle several situations at one time. In a highly unusual move, Benchmark, a top shareholder, is suing Uber to have Kalanick removed from the board altogether. Benchmark has also refused to sell any of its shares to SoftBank unless it states in writing “that it would reject reappointing Kalanick as chief executive officer and block his appointment as chairman of the board or head of one of its subcommittees,” according to sources speaking anonymously with Bloomberg. Uber would get more cash, Benchmark might feel happy enough to drop its legal action, and some sort of reliable leadership structure would be decided. On top of that, the proposal would also give Khosrowshahi the power to appoint the replacements for the seat of the company’s three directors—Ryan Graves, Arianna Huffington, and Wan Ling Martello—in the event that they decide to leave. It would also formalize a plan to take the company public by 2019. The IPO would only require the approval of one-third of the board. Not only will the future of Uber’s leadership be decided tomorrow but Khosrowshahi will be in London meeting with the city’s transportation commissioner and begging to be allowed to resume his company’s operations after they were abruptly shut down almost two weeks ago. Reuters obtained an internal email that announced Uber’s manager in London will be leaving the company. Khosrowshahi has formally apologized to authorities in London for Uber’s mistakes and has given his assurance that things will be different going forward. For now, things seem just as chaotic as they’ve ever been and Kalanick is sitting in the center of the storm, just as he always has.